On June 30, I picked up my new IC-756Pro3 (S/N 32025XX) at a local dealer. That evening, I installed the Pro3 in my station. Preliminary findings are that it pulls weak, noisy signals out of the noise somewhat better than the Pro2. I was able to work a number of SSB stations on 40m which I would not have heard on the Pro2. The NR and NB appear to have been significantly improved. Overall, I would judge that the S/N ratio is better than on the Pro2, even in the presence of power-line noise. I find myself routinely operating with the preamp off; on the Pro2, I invariably had Preamp 1 on. The next day, I was able to sustain the sked with my friend Matt KK5DR somewhat longer, as the Pro3 "hears" signals buried in the noise somewhat better than the Pro2 did. I am able (by using a combination of NR, NB, Twin PBT and Manual Notch) to squeeze intelligible copy out of the assorted "garbage" on the band more effectively than on the Pro2. In addition, the Pro3's strong-signal behaviour appeared to be excellent. S9 + 60 dB signals 1 to 2 kHz above and below our channel edges did not produce any perceptible artefacts in the received audio. When switched in, Preamps 1 and 2 do not raise the audible noise level in the receiver as much as they did in the Pro2. In the Pro3, the preamps have been designed for highly linear large-signal handling, consistent with a low noise figure. Preamp 1 has negative feedback to improve linearity without compromising NF. There has also been a significant gain redistribution. The first mixer has lower gain, with the result that the scope module in the Pro3 has its own RF amplifier to bring up the vertical sensitivity of the scope. The ALC is a little less sensitive; I need to set the Quadra ALC menu to 5 bars for 1kW output, vs. 4 bars for the Pro2. As is the case for all other Icom HF transceivers, the rear-panel ALC jack is compatible with a negative-going ALC voltage in the range 0 to -4V. Positive voltage should never be applied to the ALC jack. In August 2007, I performed an ALC overshoot test on my Pro3/Quadra station. Here is the test report. There have been some improvements in operational convenience. The mini-scope is great - you can now display 3 windows; frequency/mode etc., mini-scope and bar-graph meter, filter menu or any other lower window that used to suppress the scope on the Pro2. There are two clock displays - UTC and local - and a simple screen-saver which displays the owner's callsign moving about on a black background. By being able to leave the bar-graph meter on-screen along with the scope, I learned that compression peaks at 6 to 7 dB when it only shows 2 to 3 dB on the much slower moving-coil meter. I have the impression that the Pro3's TFT display is superior to that of the Pro2. The screen image is brighter and a little sharper, the contrast is much better and the colours are more saturated. HP8640B signal generator, calibrated against R&S URV4-03 RF power meter with 0 dB probe; Sinadder 3 configured as true RMS audio voltmeter connected to [SPKR] jack. NB off, NR off, ATT = 0 dB, AGC MID. Offset tone pitch = 1 kHz (SSB), 600 Hz (CW). SSB and CW "Sharp" filter shapes selected. 1: MDS (Minimum Discernible Signal). In this test, MDS is defined as the RF input power which yields 3 dB unweighted S/N at the output. The results obtained are very close to those in Ref.2. 2: Reciprocal Mixing Noise. Reciprocal mixing occurs in a superheterodyne receiver when the noise sidebands of the local oscillator (LO) mix with strong signals close in frequency to the wanted signal, producing unwanted noise products at the intermediate frequency and degrading the receiver sensitivity. Reciprocal mixing noise is a measure of LO spectral purity. In this test, a strong "undesired" signal is injected into the receiver's RF input at a fixed offset from the operating frequency. The RF input power is increased until the receiver noise floor increases by 3 dB. The reciprocal mixing noise parameter, expressed as a figure of merit, is the difference between this RF input power and measured MDS. The test is run with the 2.4 kHz SSB filter selected, and preamp off. The higher the value, the better. 3. 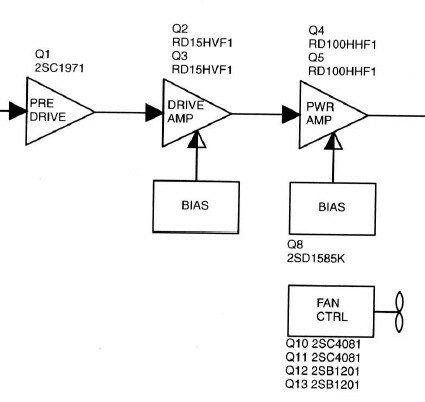 DSP-IF filter shape factors. A quick check of -6/-60 dB shape factors was performed for the 2.4 kHz SSB, 500 Hz CW and 250 Hz CW IF filter settings. (Note: BPF Indicator was on for CW filters.) Shape factors for all 3 filter settings met or exceeded Icom's advertised specifications. The measured -6/-60 dB shape factor for the 2.4 kHz SSB filter was 1.24; the spec is 1.5. Tip: To achieve optimum S/N ratio, the selected IF-filter bandwidth should not exceed the occupied bandwidth of the received signal. 4. SHARP vs. SOFT SSB filter roll-off. Test conditions: 10.000 MHz LSB, 2.4 kHz filter selected, RF input power -103 dBm (below AGC threshold), AGC off, preamp off, ATT = 0, NR off, NB off, Twin PBT neutral. Table 3 shows the roll-off for the [SHARP] and [SOFT] filter settings. 5. NR noise reduction, measured as SINAD. This test was intended to measure noise reduction on SSB signals close to the noise level. Initial test conditions: Sinadder configured for SINAD measurement. 10.000 MHz LSB, 2.4 kHz filter selected, AGC MID, preamp off, ATT = 0, NR off, NB off, Twin PBT neutral. The receive frequency was offset +1 kHz to produce the test tone, and RF input power was adjusted for a 6 dB SINAD reading (-127 dBm). NR was turned on, and SINAD read at 30% and 50% (max.) NR settings. The results are given in Table 4. This shows an S/N improvement of 8 dB with NR at maximum for an SSB signal roughly 6 dB above noise level. This is an approximate measurement, as the amount of noise reduction is dependent on the original signal-to-noise ratio. As in the IC-7800, the upper and lower -6 dB points of the transmitter audio-frequency response are independently programmable. This capability, along with the bass and treble equalisation menu, offers many intriguing possibilities. Thus far, I have been using default settings, but plan to do more experimentation. As discussed in the ARRL Test Report, CW operators will be very relieved to hear that the "dit-clipping" problem which plagued the 756Pro2 in full-break-in mode has been completely eliminated from the 756Pro3. A quick check has confirmed this. It has been reported that the Pro2 NR's heuristic correlation-discrimination process (correlated signals vs. non-correlated noise) becomes "acclimatised" to the prevailing SNR and becomes less effective over time. Keying the transmitter reinitialises the NR process, creating a perception of improved NR efficacy. George W5YR has contributed an article on this topic to my IC-756Pro/Pro2 User Review. Ref.1, Section 5-2-1, describes NR in greater detail. In CW mode, the NR will be less effective, as the noise bandwidth is much less than in SSB, and the NR algorithm has less noise power to work with. I find that with NR at 50%, there is a noticeable noise reduction with the 1.2 kHz filter, less with the 500 Hz filter and none to speak of with the 250 Hz filter. Again, this is to be expected (N = kTB). During the test I conducted, I selected AGC = FAST. I did not observe distortion of the CW signal at any NR setting, even with the IF bandwidth reduced to 50 Hz via Twin PBT. (At the time, I was listening to CW signals varying in level between S0 and S5.) When I operate CW, the NR control stays at 50%. The noise reduction obtained with BW = 500 Hz and above is still useful. The received audio in CW mode is much more pleasant to listen to, and less fatiguing, than on the 756Pro2 or 756Pro. This is particularly noticeable when using the narrow IF filters (500 Hz and less). The "background" is much quieter, and the "ringing" effect previously reported in the 756Pro and 756Pro2 (especially with CW Pitch < 600 Hz) is almost inaudible in the Pro3. I listened to an S0 to S1 CW signal with BW = 50 Hz (SHARP shape factor, BPF on) and obtained very pleasant single-signal copy, even at that narrow bandwidth setting. The low-frequency rumble reported in the 756Pro has been completely eliminated in the 756Pro3. Q: Is the information in the IC-756Pro/Pro II User Review on the BPF Indicator and CW filter settings also applicable to the IC-756Pro III? Let me start by remarking that my background in telecommunications engineering strongly influences my view of amateur radio. From my perspective, the sole mission of an SSB radiotelephone communications system is to "get the message through" with the highest possible articulation index at the receiving station, under a wide variety of propagation conditions. This objective should be achieved in a manner that conserves transmitter power, and ensures that the available power is concentrated in that portion of the human speech spectrum which most influences articulation - typically about 350 ~ 2700 Hz at the -6 dB points. Excessive transmitted energy below approx. 250 Hz robs transmitter power (remembering that an SSB transmitter is peak-power-limited) without contributing to the articulation at the receiving station*. In addition, the practice of "force-feeding" - deliberately boosting the low-frequency portion of the baseband - can drive the speech amplifier into non-linearity, generating harmonics which mix with the mid-band speech components to yield a rich harvest of intermodulation products. These products "muddy" the transmitted audio. In extreme cases, excessive baseband input levels can over-range the ADC, with ruinous consequences for the modulation process. Especially when using compression, the lower -6 dB point should be no lower than 250 to 300 Hz (corresponding to the default MID TBW setting). * In one extreme case recently encountered on 20m SSB, the low-end "power-grab" was so severe that the distant station's lows swamped the AGC, rendering the signal unintelligible. Just a low-frequency rumble was audible in the headset. Only by "slicing away" the low end with 2.4 kHz IF BW and Twin PBT was I able to recover intelligible audio - and the S-meter reading dropped from S7 to S2! It should also be noted that the 15 to 18 kHz high-end response of some "broadcast-type" mics is wasted on a system which is 6 dB down at 2900 Hz and 13 dB down at 2950 Hz. In the IC-756Pro series, a steep analogue LPF in the baseband signal path before the ADC input sharply attenuates frequencies above 3 kHz, to prevent ADC overload at frequencies above the programmed DSP cutoff. The Heil HC-4 and HC-5 elements, and the Heil PR-781 microphone, are excellent examples of transducers specifically designed for the transmission of human speech with optimum articulation. 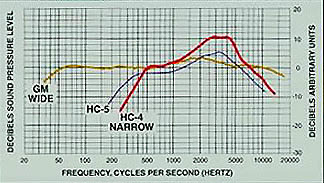 The frequency response of the HC-5 is 300 Hz to 6 kHz at -6 dB, with 6 dB rise at 2 kHz. The HC-4 frequency response is 600 Hz to 6 kHz at -6 dB, with 10 dB rise at 2 kHz. It will be seen that both these elements are peaky around 2 kHz. This is, in effect, a form of pre-emphasis which if accompanied by a judicious amount of compression, can increase intelligibility at the distant station even under unfavourable band conditions. Their output is significantly lower than that of an electret element, but will drive the Pro-series radios to full output with Mic Gain at 50%, and about 6 dB of compression. Refer to "DSP Audio Settings for Heil Microphones". The secret of effective, articulate SSB voice communications lies in a combination of a -6 dB transmit audio response of 350 ~ 2700 Hz, 6 dB of compression and 6 to 10 dB of pre-emphasis at 2 kHz in the microphone. That said, a lower cutoff frequency in the 150 - 200 Hz range can yield improved articulation under some propagation conditions. The operator should feel free to experiment with different settings, but care should be taken to ensure a flat transmitted audio response. The spectrum scope can be used to advantage here (Scope on TX ON). *Set COMP for 6 dB compression on voice peaks (on bar-graph meter). The IC-756Pro3 transmitter offers a combination of bass/treble equalisation and AF response adjustment (selectable low and high -6 dB points.) With this much flexibility, it should be possible to configure the radio to work well with almost any microphone. Given the communications mission referred to above, though, the best choice will always be a microphone optimised for radiotelephone communications, as opposed to a microphone more suited to broadcast or recording applications. The same general considerations apply to output transducers as to microphones. The amplitude/frequency response of a headset or speaker intended for radio communications should closely match that of the receiver to which it is connected. If the receiver is 6 dB down at 200 Hz and 2.7 kHz, the transducer's -6 dB points should be in the same range. The use of a "wide-range" transducer with a -6 dB response of 50 Hz - 18 kHz can actually be counter-productive, as it can pass mains hum at the low end and white noise (hiss) at the high end. These unwanted sounds can actually degrade articulation when listening to weak and/or noisy signals. In the IC-756Pro3, there are 180Ω resistors in series with the tip & ring leads of the front-panel [PHONES] jack (one resistor in each lead). (More information here). With Preamp 2 enabled, 0 dB attenuation (RF and scope) and autotuner disengaged , the Pro III spectrum scope will display a visible spike with 0.06 µV (-131 dBm) at the antenna socket. (This was measured at 14.1 MHz with the HP8640B signal generator, calibrated against the R&S URV4-03 RF power meter with 0 dB probe.) The radio was also in CW mode, with the 500 Hz filter selected. The corresponding figure for the Pro II was 0.12 µV (-125 dBm). The Pro III scope, like its predecessors, has a resolution bandwidth (RBW) of 1 kHz at -6 dB. View a typical scope screen. I have noticed a slight interaction between Spectrum Scope vertical amplitude and Dual Watch BAL control setting on the IC-756Pro3. Dual Watch was enabled, with 14316 kHz on MAIN, and 14186 kHz on SUB. When I rotated the BAL control fully clockwise to cut off the Main channel, I observed that the scope grass level rose approx. 6 dB. Note: Several units of each model type were checked. This is what I believe is happening: The Pro 1st mixer is followed by an LPF. When the PIN diode attenuator is cut off, the LPF is mis-terminated (looks into an open.) This apparently reflects a lower impedance back towards the 1st mixer, loading it down and reducing the signal amplitude at the scope input. In the Pro2, there is no LPF following the 1st mixer. The mixer output is fairly low-Z, so the mis-termination when the PIN diode attenuator is cut off will not cause much change in signal level at the scope pickoff point. In the Pro3, the 1st mixer has a lower IF output than in the Pro or Pro2 (hence the need for an RF amplifier in the Pro3 scope input line). It is likely that the 1st mixer output is noise-matched to the PIN attenuator, in which case it will have a higher source impedance to match the load conjugately. The rise in load impedance when the attenuator goes to cut-off will cause approx. 6 dB increase in output voltage. The scope input voltage will rise by the same amount. This is surmise on my part; I have not opened up the radio to take measurements. This phenomenon is interesting, but not a major issue as it does not affect receiver performance at all. In practice, with Dual Watch on, the BAL control is normally set between 40 and 60%, and the interaction does not occur. Matt KK5DR has found that the IC-756Pro3 autotuner tunes a little faster than that of the IC-756Pro2. A quick check on my Pro3 confirmed this. Q: Does the IC-756Pro3 have a synchronous AM detector? A: None of the Icom DSP-based HF transceivers has an AM synchronous detector in the sense of a phase-lock demodulator which regenerates the incident carrier, demodulates the sidebands against the local carrier and "votes" the sideband with the best S/N ratio. All the Icom DSP-based radios (including the IC-746Pro, the IC-7800, the IC-756Pro series and the IC-7000) employ the same DSP algorithm. This models a phasing-type modulator and demodulator for SSB and AM. The difference between SSB and AM is that in SSB, the unwanted sideband is cancelled, whereas in AM the upper and lower sidebands are added in phase to produce the composite baseband. Unlike a true synchronous detector, the AM demodulation process in the Icom DSP design does not "vote" the sideband with the best S/N ratio. AM broadcast reception is very effective on the IC-756Pro series, but is subject to selective fading. One can use ECSS (by receiving AM in SSB mode) to reduce this, and select the quieter sideband manually. Q: Can you explain the amplitude-sensitive digital artefacts which appear on the transmitted AM signal? A: With any system involving A/D and D/A conversion, quantizing distortion will occur at high signal levels. This will manifest itself as noise on modulation peaks. As the ADC and DAC used in the Icom radios are 24-bit devices originally intended for high-grade audio applications, quantizing distortion will be insignificant as long as the devices are not overdriven. Note that as the analogue input level to the ADC approaches the "all 1's" point, quantizing distortion will increase sharply. If [MIC GAIN] is set for 90% modulation, using the Spectrum Scope as described here, the ADC will remain well within its linear range. Also as discussed above, Po must not exceed 25W resting carrier. The spectrum-analysis test (described here) yielded a clean display, without visible artefacts. In January 2007, I ran an AM listening test on my IC-756Pro3 at 25W resting carrier and 90% modulation, using a simple tuneable demodulator consisting of a military ME-61/GRC field-strength meter connected to a good-quality headset . The recovered audio sounded smooth and clean, without audible artefacts. This tended to confirm the spectrum-analysis test. The RX-ANT input socket is intended for the connection of a separate receiving antenna such as a Beverage, loop or long-wire. Such antennas, if co-sited with the transmitting antenna, can induce extremely high voltages at the RX-ANT input during transmission. This is particularly true on 160m and 80m. Recently, damage to the front end of an IC-756Pro2 fed from a Beverage was reported on some forums. On researching this topic a little further, I noted that the 756Pro and 756Pro2 RF Unit boards have a varistor (R111) to absorb excess RF voltage, and a fuse bulb (DS111) in the RF signal path from the RX-ANT jack to the ANT/ANT-R selection relay (RL101). Excessive RF power applied to the RX-ANT jack will blow DS111. On the 756Pro3 RF-B Unit board, varistor R101 is still seen, but DS111 has been omitted. Interestingly enough, though, the 756Pro3 RX-ANT circuit incorporates an RF sensor (D101, Q103, Q104) which operates the selection relay (RL-101) when RF is applied to the RX-ANT socket, thereby breaking the RX-ANT signal path. This feature is lacking in the 756Pro2. 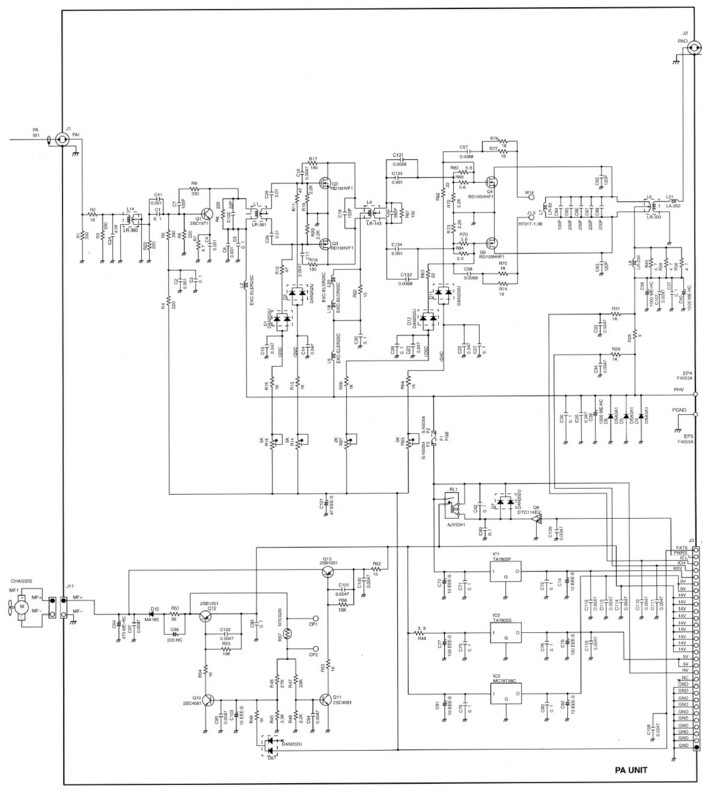 View partial schematics of the IC-756Pro3, IC-756Pro2 and IC-7800 RX-ANT input circuits. It is strongly recommended that an external protective relay circuit such as the KD9SV Front End Saver be connected between the receive antenna feedline and the RX-ANT input. Q: Are the ANT1 and ANT2 inputs both grounded when power is off? A: No, this is not the case. If we follow the RF signal path on the CTRL-A Unit from ANT1 and ANT2 to the RFRX input (RF-B Unit), we see that when RL1, RL2, RL3 and RL4 are released, the signal from ANT1 is routed via RL3/1 NC, RL2 NC, RL1 NC, RL4 NC. L27 and L28 to J2 (RFRX). ANT2 is earthed to chassis via RL3/2 NC. (IC-756Pro3 Service Manual, p. 10-5). All relays are released when power is off. View partial schematic. Q. When I turn on the Calibration Marker, the S-meter reads S9 + 14dB with the antenna disconnected and S9 + 11dB with the 40m antenna connected. Does this 3 dB difference mean that half the Marker power is going out the antenna? Also, can I use the Marker to check S-meter calibration? A. 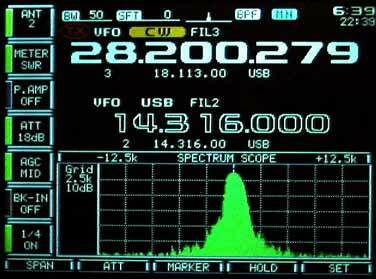 The marker amplitude as displayed on the spectrum scope will vary slightly between individual radios. One can use it as a rough check to see if the S-meter is reading correctly. The marker signal is applied at the input of the splitter which feeds the incoming RF signal to the Main and Sub 1st mixers. The load impedance presented to the marker source changes slightly if the antenna is connected with no preamp in the signal path; this may account for the drop in amplitude with the antenna connected. With Preamp 1 or 2 selected, there is no change, as the preamp buffers the marker injection point from the antenna input. If you are concerned about this leakage, you can enable Preamp 1 or 2 whilst the marker is on. In response to an enquiry, I measured CW rise-times on my IC-756Pro3 using a Tektronix 455 oscilloscope connected to a line sampler placed between the ANT2 socket and a 50Ω termination. Test Conditions: f = 14050 kHz. Po = 10W. Time-base set to 1 mS/div. Note: Rise-time is defined as the time to go from zero to 100% Po. 6 vertical divisions = 100% Po (p-p). The test results are listed in Table 6. The test screenshots can be seen here. Test Setup: IC-756Pro III, S/N 32025XX, with XVERT jack connected via coax jumper to 50Ω terminated probe of Millivac MV-723B RF Millivoltmeter. (IC-756Pro III User Manual, p. 18). 7-pin DIN plug with Pins 6 (XVRT) and 7 (+12V) bridged via 27KΩ 0.25W resistor, plugged into Pro III ACC (2) socket to activate XVERT mode. Pro III set to 28100.000 kHz, RTTY mode. In receive, the signal applied to the XVERT jack is routed to the RF BPF input. The transverter IF output power at this point should not exceed approx. -13 dBm. The ALC RCA jack is active in XVERT mode. A transverter equipped with a negative-going ALC line (0 to -4V DC output) will be compatible with the exciter's ALC jack. There have been reports of low SSB power output in the IC-756Pro3. It has been found that all too often, these are the result of incorrect measurement methods, inaccurate test equipment and/or low DC primary supply voltage. Measure the power output in CW, FM or RTTY mode with RF Power fully clockwise, and your power meter terminated in a good-quality 50-ohm resistive load. A calibrated Bird 43 or equivalent average-reading meter accurate to within 5% is recommended. Using an accurate DVM, check the primary DC voltage at the rear-panel power socket with the radio delivering maximum output. At 13.8V DC, the transmitter should deliver 100W or more to the load. Run the SSB PEP test described here. An oscilloscope is required for this test. If the displayed envelope amplitude on voice peaks is equal to the carrier amplitude in RTTY mode for 100W output, the Pro3 PEP output is 100W. Note: If the CW output measured in Step 1 is significantly less than 100W with 13.8V primary DC input, or if PEP output measured in Step 3 is significantly below 100W, the radio may require realignment or repair. If the radio is still under warranty, or if you do not have access to the test equipment specified in the service manual, do not attempt any alignment procedures. The radio should be sent in to an authorised Icom service centre. Mitsubishi, the manufacturer of the 2SC5125 used in the 756Pro series PA Unit, have recently discontinued all their RF power BJT lines. This event has forced Icom to design a new PA Unit based on MOSFETs. To the best of my knowledge, the new PA is showing up in US/Canada Pro3's (#32 variant)* with S/N 32045XX and higher. The MOSFETs are also Mitsubishi parts. The original PA Unit uses BJT's, not FET's (2SC1971 pre-driver, 2 X 2SC1972 driver, 2 X 2SC5125 PA.) The line-up in the new PA Unit is as follows: 2SC1971 (BJT) pre-driver, 2 X RD15HFV1 (MOSFET) driver, 2 X RD100HHF (MOSFET) PA. The HF/6m PA in the IC-7000 also uses a pair of RD100HHF's. A typical MOSFET circuit will have 13 dB power gain vs. 10 dB for a BJT circuit. This reduces the required drive power by 50%, i.e. 5W vs.10W drive for 100W output. This will reduce the driver stage's IMD contribution. The MOSFET PA already has slightly lower IMD (perhaps 1 or 2 dB), so the transmitter will be cleaner overall. Owners of IC-756Pro3's with the earlier PA Unit need not be overly concerned. The 2SC5125 is a very tough device, and should last for many years with reasonable care. The Toshiba 2SC2782 is a sub for the 2SC5125, and is available from RF Parts singly and in matched pairs. Furthermore, I am confident that Icom laid on an adequate stock of BJT parts at their service centres to maintain the existing installed base when Mitsubishi advised them of the impending discontinuance. It should be noted that the IC-706 MkIIG went through a similar exercise a few years ago when Motorola discontinued the PA devices. Greg Buhyoff K2UM kindly provided a partial block diagram and schematic of the new PA Unit (originals courtesy Icom Inc.) I am also indebted to Greg for supplying photos of the new PA Unit. * Other regional variants will have different serial number ranges for the change-over to a MOSFET PA. Note: Rumours that Icom redesigned the PA Unit in response to "PA failures" or "low output" are patently untrue. Q: On my IC-756 Pro III, I am trying to understand how to get rid of that awful crackling and popping sound I hear when on CW mode. This is the only mode on which I hear it; it is really distinct and repeatable when I rotate the CW pitch control, and is most prevalent on 30 and 40 metres. NB settings: How much NB is needed? Is NB threshold too high (> 75%), causing distortion? Antennas in use: Beverage on RX-ANT input or TX/RX antenna? If a Beverage antenna is in use, there could be induced voltages on the antenna requiring bleed-off. AGC: Does the crackling and popping exist with the AGC turned off? If yes, turn off pre-amps and attenuate the signal. In general, it is wise to avoid turning the AGC off, to prevent ADC over-ranging which will cause severe distortion. On 40m and below, the "dBm from Heaven" technique is effective in reducing the noise level. Test without antenna: Does the static and popping occur without an antenna? If so, it is internally generated, and could indicate a faulty DSP Unit. It has been observed that the screen-saver never appears if a mono plug is inserted in the front-panel ELEC-KEY jack. This is normal. The ELEC-KEY jack has tip and ring leads. Even if Keyer Type is set to Straight in the KEYER menu, the radio's CPU still senses both leads. Although a ground on the ring lead will not key the transmitter, it still acts as an external event or "stimulus" which will clear the screen saver. If a mono plug is inserted, the plug shell will ground the ring lead, thus clearing the screen saver. For this reason, a stereo plug should always be plugged into the ELEC-KEY jack - even when using a straight key or external keyer. The rear-panel KEY jack will accept a stereo or mono plug. Every few months, a discussion of "IC-756Pro3 heat issues" pops up on the forums. In fact, there is nothing to be concerned about. The Pro3 does not overheat - as long as it is installed with adequate clear space around it to allow sufficient air-flow for cooling. At least 4" (10cm) of clear space around the top case cover and the rear panel are recommended. The front feet should also be extended. The vent slots in the case and rear panel must be unobstructed at all times. If the Pro3 is correctly installed to allow sufficient air-flow, no additional external fans should be necessary. This has been my experience with the entire IC-756 series since 1998. To my knowledge, there have been no reported instances of Pro3 failures due to overheating. It should be noted that direct attachment of small muffin fans to the case vent slots of the Pro3 can be counter-productive. Should these fans fail for any reason, they will obstruct the radio's air-flow with resultant overheating. NEVER install the transceiver in a place without adequate ventilation. Heat dissipation may be affected, and the transceiver may be damaged. Refer also to Matt KK5DR's "Hot Radio" page, and to the description of the Pro3's temperature-control circuit. Copyright Â© 2005-2009 A. Farson VA7OJ/AB4OJ. All rights reserved.